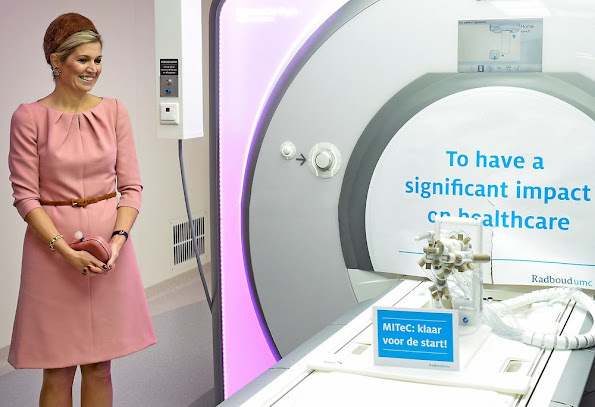 Queen Máxima of The Netherlands opens three innovative operating rooms in the Medical Innovation & Technology Expert Center (MITEC) of the Radboud University Nijmegen Medical Centre in Nijmegen on November 12,2015. What ever is that on her head? No no no, Why Maxima do you need all this ugly hats or should we say bathing cap on your head. She is wearing the colour of Pepto Bismal! She wears Princess Marys last colour and it suits her. The color and style of the dress are lovely, the hat takes away a little. I like the dress, the color pink ooks good on her but not so much the hat, looks like its made of wool and is brown. The back of the hat is worse than the front if possible. It does nothing for her. I think Maxima is great, her vibrancy and zest for life are wonderful. I love the dress, the colour, the style, I just don't get the hat! This is quite soon after she left the hospital for her kidney infection. I think she's lovely and loyal to her people.